Make your escape to Antarctica a journey to remember with Polar Pioneer Early Bird Deals. 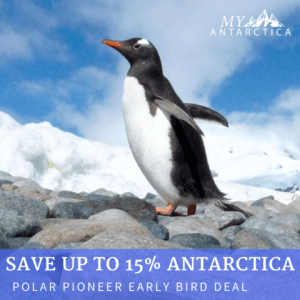 For a limited time, you can save up to 15% off selected cabins and journeys to Antarctica on the Polar Pioneer, one of the most intimate expedition ships around. The Polar Pioneer explores the Antarctica peninsula and surrounding regions such as South Georgia, the Falkland Islands and even Weddell sea in a range of cruising and combination fly cruise programs. Accommodating only 86 guests, the Polar Pioneer offers personalised service, comfortable cabins and a first hand interactive adventure of the white continent with daily landings, zodiac rides and an extensive lecture program led by experts on board. Polar Pioneer Antarctica programs also feature visits to Puerto Williams, a stunning sub antarctic island as part of their experience and themed departures (e.g. photography) and special activities (kayaking, polar skiing, camping) are available on different dates. Polar Pioneer cruise rates start from US$9,700 in a triple share basis. Up to 15% savings on selected departures and cruise categories on Polar Pioneer Antarctica departures for 2018/2019. The terms: Polar Pioneer Early bird deal highly subject to availability. Savings available on the first 20 cabins sold for each departure. Bookings must be placed and deposited by 30 September 2017.